Here is what Andy had to say about putting together the biggest metal show on earth. You started your career in the music business as a DJ at Rock clubs in Lincoln and then Nottingham in the UK. When that ended, what was the chain of events/progression that led to your current position as Booker for the Download Festival and Promoter for Live Nation? At Rock City in Nottingham, I’d started to advise them what bands they should book, as the club became a concert venue, as well as a club. They then offered me a full time position as the promoter at the venue. Soon, I gained a reputation as the go to guy for anyone who had a question about bands. I started getting head hunted by other companies, which I’d always turned down. Finally I decided to take the plunge and join the company I’m with now, to become a national concert promoter. One of the first tasks I was given was to re-launch a rock festival at the Donington Park Race Track, which had previously staged the Monsters of Rock Festival in years gone by. Download was born! Since you attended Donington Monsters of Rock in the 80’s and 90’s as a fan, what if anything, has changed about the audience, now the name and structure is different? The audience is definitely more demanding these days as, they are more informed and expect more for their money, which is fair enough. The competition is extremely fierce in the festival world, so the expectation level from your audience is sky high. How often,(if ever do you get star stuck when you meet a band/artis,t or go to a show? I ALWAYS get star struck! I’m still a fan, so whenever I see a band or an artist that I work with, I still get that feeling. 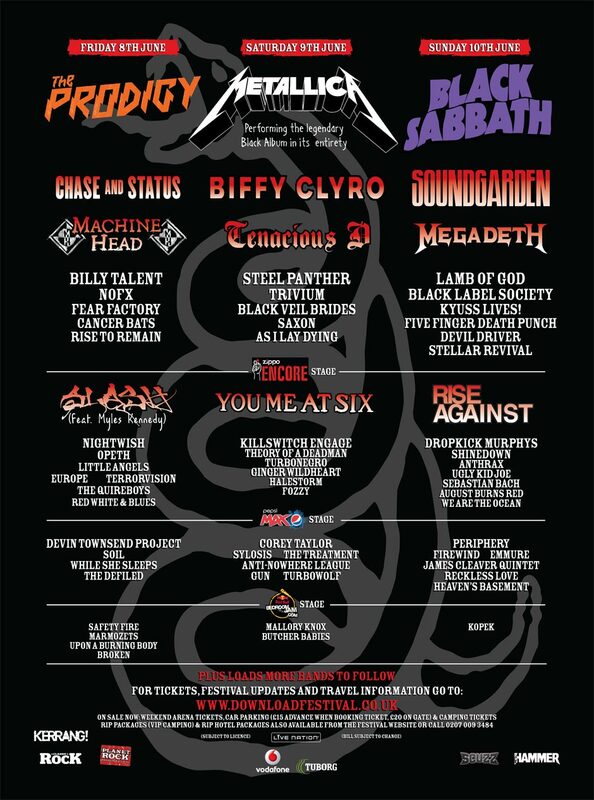 The line-up for 2012 includes Black Sabbath and is one of their only live performances, due to Tony Iommi being ill. How did you secure that booking when everyone else has had cancellations from the band? The fact that Tony Iommi is in England receiving his treatment (which he is responding to very well, I have to say) and he lives only 30 miles from the festival site, has made the difference. Because of Tonys condition, he cannot travel long distances, but he desperately wants to play Download with Black Sabbath, so thankfully, with the festival site being so close to his home, he’s going to do it. We are extremely privileged. Rumours abound that Metallica plan to play the Black album in its entirety. Will that be filmed for TV or band merchandising and how was that decision made? Did Download have any input on that decision? I wanted Metallica to play at Download in our tenth year, but wanted to give it an edge. I knew it was 21 years since the release of the Black album, which is the biggest Metallica album of all time and the record that crossed them over to a wider audience, so I thought that it would be a great idea to get them to play the album in full as part of their set. They had no plans to tour in 2012, but I got on a plane and flew to New York to pitch my idea to the bands manager Peter Mensch. He liked the idea, took it to the band and they loved it! What influences your choice of artists from one year to the next? Do you go with gut, who is making waves that year or just because you want to see that band. What is your strategy? I try and get something a bit different every year. Faith No More three years ago, was a band that I’d worked on getting back together for Download and it was great to finally get them to do it. Download in 2009 was their first show back together in 13 years. The same with System Of A Down last year… Download has been a massive influence into getting bands back together. Some of these bands I have a personal contact with, others I have to go hunting after with my idea. Thankfully, it has proved to be successful and it has helped bands get back together again, if only for a short time. Of course you cannot please the people all the time. Do you take guidance from the masses? The social media outbursts can be terribly abusive, if the fans think you are getting it wrong. How do you deal with that? You have to talk to the fans and that has its downside. I have been personally abused on many occasions but you have to take the rough with the smooth. Most of the fans appreciate the fact that they have a voice and that someone will listen to them. As festival organisers, we have to listen to them…they are the ones paying the money. We have put a lot of time and resources into communicating with the Download audience and it has certainly paid off. We have made many changes to the festival on the strength of public opinion and certain suggestions that have been put to us have been implemented to make Download better. The few that abuse you are few and far between. It’s not cool but I live with it. What is the most difficult thing you have to deal with when hosting big names that possibly expect 4 star service wherever they go? It goes with the territory. Bands are extremely demanding and you have to adhere to their requests regardless of how crazy some of them are! I guess the most difficult thing is dealing with the amount of bands we have over the weekend (130+!) and making sure they are all happy. It’s not easy, but it is important that they have a good experience so that they can put on a great performance. How many weeks prior to the show are things being set up in and around Donington Park? It would seem to be a possible logistical nightmare! Booking the bands is a 52 week a year job. I’m already talking to bands for 2013. We start building the festival site ten days before the event and it’s like building a city with all its relevant facilities. It’s a massive undertaking and the production team do an amazing job…I’m glad I just have to book the bands! Will you eventually endeavour to bring the show to N. America and repeat the show for those too far away to attend? Again, logistical hell! You can’t rule out the fact that we could bring the Download brand to other territories. We have done it in the past and will certainly do it again. You have bands at Download over several days, on several stages. How do you decide which bands play at the same time so the fans do not miss the bands they want to see? It’s a juggling act for sure. We have five stages all operating at the same time, but we want to ensure that people have an alternative so that there is something that they really want to see at any given time. There are the occasional clashes and that is inevitable, but I keep these to a minimum by putting bands from different sub-genres on at the same time. In this day and age safety is a major priority. How do you cope with 100,000 for three festival days, taking into consideration dehydration, sunburn, alcohol poisoning, stomach flu etc? Obviously, health and safety is a major priority for us and we have to make sure that the fans welfare is at the top of our list. We want them to have a great weekend without any problems. We of course, rely on people having common sense to not do anything that can hurt them in any way, but we do have a huge amount of medics on site and welfare volunteers to take care of any isolated incidents or problems. In the UK there is a specific Pop Code that we have to adhere to, which outlines all the basic fundamental processes we have to put in place to take care of the customers. It’s a very good guideline to work to, but you always have to expect the unexpected and be prepared. 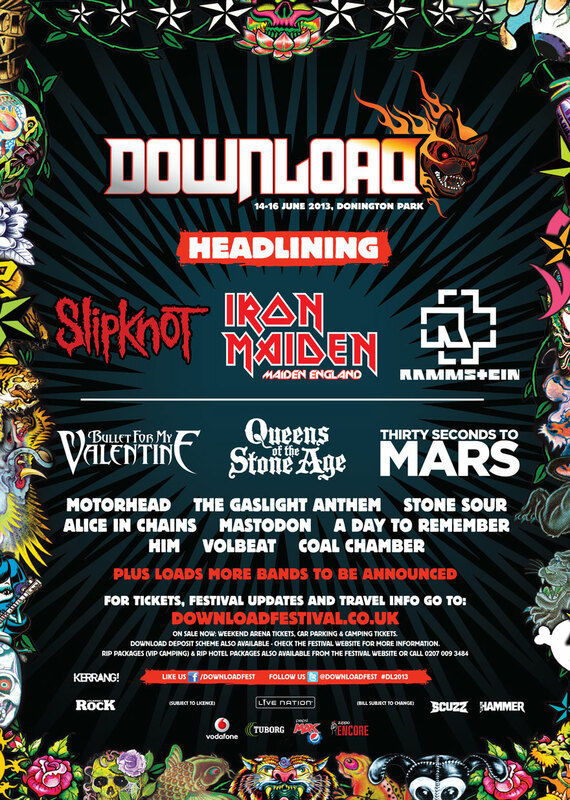 How do you make Download bigger and better every year? I can only put on the best festival that I can, with the bands that are available to me. Every year I am looking for new things and new ideas to improve the festival…as I said previously, we speak to our customers and tickets buyers daily via the social networks and we will continue to do so. Download has been around for 10 years and we want to and intend to be around for another 10 years and beyond……..